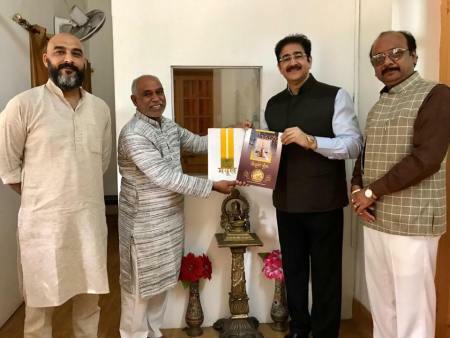 New Delhi: A well known art and culture promoter Sandeep Marwah met Amir Chand of Sanskar Bharti along with Anupam Bhatnagar and Sumit Maluja of Udan to discuss new programs to promote patriotism in the country. Amir chand presented the new issues of magazine of Sanskar Bharti to Sandeep Marwah and welcomed the idea of fresh and interesting programs. 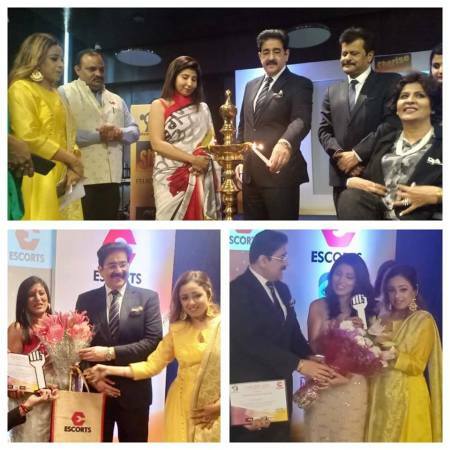 Sandeep Marwah is also patron to a cultural organization Udan and film promotion body Bhartiya Chitra Sadhna of RSS and has been associated with both the organizations from its inception. Sanskara Bharti is working in various sections of the society with the aim of preventing cultural pollution through awakening patriotism and decent rites, encouraging the training of various arts and encouraging novice artists. Since 1990, the annual session of Samskar Bharti is organized in the form of Art Sekhak Sangam, in which musicians, plays, painting, poetry, literature and dance forms, established and novice artists from across the country exhibit their art.